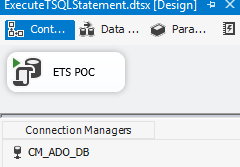 The Execute T-SQL Statement Task is another of the Maintenance Tasks. As such, you'll need an ADO.NET connection to make this work. A package is built out with an ADO.NET Connection Manager and the Execute T-SQL Statement Task.